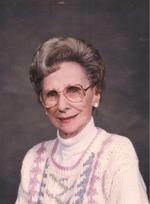 Betty Maxine Toomey- Whitcum age 96, of Ashland, died Tuesday July 31, 2012 at her residence. She was born January 21, 1916, in Ashland the daughter of Milo and Maude (Miller) Toomey. Mrs. Whitcum had been a resident of Ashland all of her life. She graduated from Ashland High School. Mrs. Whitcum had been a Homemaker and had also retired from retail sales, where she had worked for the College book store and later at the Hospitality Shop at Samaritan Hospital. Mrs. Whitcum had been a member of the First United Methodist Church most of her life and had been active with the Inter- Nos Sunday School Class. She was a member of the Ashland Chapter #92 Eastern Star, Thursday Study Club (Past President); American Legion Auxiliary; American Red Cross (past Blood Program Chairperson); Samaritan Hospital Auxiliary (Past President); A.A.R.P. ; along with various Bridge Clubs. Mrs. Whitcum had also been a Samaritan Hospital Volunteer since 1950, a spokeswoman for Breast Cancer Awareness; she received the Gladys H. Thomas award from the Red Cross for Volunteer of the Year in 1996, and had been active with Ashland County’s Welcome Wagon where she enjoyed greeting new residence to the community. Mrs. Whitcum enjoyed cross-stitch, playing cards, and dancing. She had also always enjoyed the progressive parties with her friends along with making and sharing photo albums and scrap books. On March 29, 1944 Betty Married Maurice Whitcum who preceded her in death in 1989. Survivors include her four grandchildren, Matthew Brodbeck of Ashland, Jennifer Brodbeck- Jordan of Ashland, Susan Whitcum of Ashland, and Michael Toomey of Georgia; two step grandchildren, Justin (Jill) VanStee and Megan (Vince) Shopbell all of Ashland; two great grandchildren, Karson Whitcum and Alex Jordan both of Ashland; her son and daughter in- law, Bruce and Sandi Brodbeck of Howard, Ohio; along with her daughter in- law, Emma Boylan of Willard. Mrs. Whitcum was preceded in death by her parents; husband Maurice; three daughters, Judith Whitcum, Sandra Whitcum, and Kaye VanStee; and two sons, Stephen Whitcum and Gary Whitcum. Funeral Services will be held at 11:00 A.M. on Saturday August 4, 2012 at the Heyl Funeral Home with Pastor Dan Bilkert officiating. Burial will follow at the Ashland Cemetery. Friends may visit with the family one hour prior to the service at the funeral home. The family suggests memorial contributions may be made to the First United Methodist Church 220 Sandusky St. Ashland, Ohio 44805 or to Samaritan Regional Health System 1025 Center St. Ashland, Ohio 44805. An on line register book is available at www.heylfuneralhome.com.